Nothing finishes the formal look like a bow tie, whether pre-tied or self-tie. In fact, it is the one piece of couture that binds everything together, quite literally. There's a reason it's the last thing you do when you dress for the event and why it demands many gentle tugs and tweaks before a satisfactory look is achieved. It is the finishing touch. And when something is this important, you should take your time choosing just the right one. 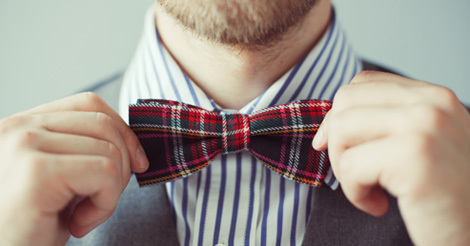 When the forerunner of the bow tie was introduced in the 17th century, it had such purposes as hiding a stained shirt, protecting the neck during battle, and even serving as a bib or napkin. Throughout its evolution, the cravat has trended toward a fashion statement rather than a serviceable piece of clothing and in the last century has found its true calling as the pièce-de-résistance of men's formal attire. Thankfully, the bow tie has evolved away from the coarse fabrics of its ancestor and is now widely available in a variety of fabrics, all suited to specific styles and occasions. Coordinating with the rest of an ensemble is essential; the 100% silk bow tie is the knot of choice with most tuxedos and dinner jackets. Of course, textured fabrics add dimension to the look, and while their appeal is undeniable, textured bow ties should always be paired with jackets of a contrasting texture. Contrast is king when bow ties are involved, not only in texture and fabric, but in patterns and colors as well. The tie itself makes a statement, and the way it complements the rest of the ensemble says more about the one wearing it than any other article of clothing. A smooth, solid shirt paired with a dissimilarly colored or patterned bow tie will have the effect of a fine gemstone in an understated yet elegant setting. If your event is black tie, a solid shirt and solid bow tie are acceptable, but under no serious circumstances are patterned shirt and patterned tie permissible. While button-down collars are best for keeping the bow tie as the focal point, wing collar shirts are popular in the black tie venues. Some less formal looks with bow ties are achieved with spread collars, but it is important to remember that no matter your choice of collar, the eye should be drawn to the bow tie, not the tips of the collar. A bow tie is a must for any formal event, but the kind of bow tie one chooses is an act of self-expression. Classical, understated, powerful, or whimsical, the tie bespeaks the man. Rush no decision regarding the ensemble, and simply refuse to settle. Insist on the choicest fabric, texture, color and style to elevate your style and make an impression to last. Trust all your formalwear needs to Krisar Clothing and rest assured your attire is in good hands.